The National Citizens Alliance (NCA) supports the integration of new arrivals into Canada with specific emphasis on economic, social, basic culture, habits, and being first and foremost a Canadian. As a party, we support new arrivals promoting and enhancing their homeland cultural, but without any funding from the government, and while at the same time integrating into the basic cultural norms of Canada. This approach applies to cultural garb including the turban and kirpan, but it does not apply to the burka or niqab, which we view at minimum as symbolic oppression of women and at worse overt oppression of women. Further, we condemn any form of honour killing, female genital mutilation, animal cruelty, and abuse of women and homosexuals. 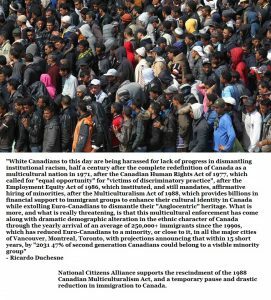 The National Citizens Alliance rejects the globalist agenda of creating a Canada that is devoid of a distinct identity and heritage, including the commonly called cultural mosaic that has no distinct values, beliefs, and cultural norms or post national globalist state. Although the National Citizens Alliance embraces the concept of diversity, we place greater emphasis upon the value of Canada’s historical identity and cultural heritage, and unity of the country. In addition, we recognize the limits on diversity as to the well-being and security of the Canadian people. The National Citizens Alliance believes that it is a privilege to come to Canada, rather than a right. In addition, the National Citizens Alliance believes that the onus is on new arrivals to prove that they share our values and can contribute to Canada’s prosperity. Further, we as a party acknowledge that economic and culture integration can be very challenging for a newcomer who seeks integration, and yet at the same time goes against his or her traditional homeland cultural and societal norms. The Integration of Newcomers policy statement requires a vote of the NCA membership to be adopted. A minimum 70 percent voting membership must support the policy and with a 50 percent quorum of voting membership as per the NCA Constitution (2014).